Diving into the R9 285’s raw specifications, the card utilizes a 1792 stream processor Graphics Core Next GPU. Paired with these SPs are 112 texture units (in the standard 16:1 ratio), and on the backend of the rendering pipeline is 32 ROPs. As is unfortunately consistent for AMD, they are not disclosing the product’s base clockspeed, but they have published the boost clockspeed of 918MHz. The R9 285 will have a rated typical board power (AMD’s analogue for TDP) of 190W. Notably this is only 10W higher than the Pitcairn based R9 270X despite the 40% larger SP count, or alternatively is 60W lower than the Tahiti based R9 280. Taking into consideration the R9 270X comparison in particular, it’s clear that AMD has done some work on efficiency to squeeze out more compared to the GCN 1.0 based Pitcairn and Tahiti parts that R9 285 is going to be competing with. The GPU itself, Tonga, is AMD’s first released GCN 1.2 GPU, with R9 285 arriving before the previously announced Tonga-based FirePro W7100. We’ll dive into further detail into GCN 1.2 on the following pages, but from a high level overview Tonga looks a lot like an optimized Tahiti. AMD has confirmed that R9 285 is not utilizing a “full” Tonga configuration, so R9 285 is not the highest possible configuration for Tonga. A complete Tonga configuration will contain 2048 SPs, just like its Tahiti predecessor, with 1792 of those SPs active on R9 285. 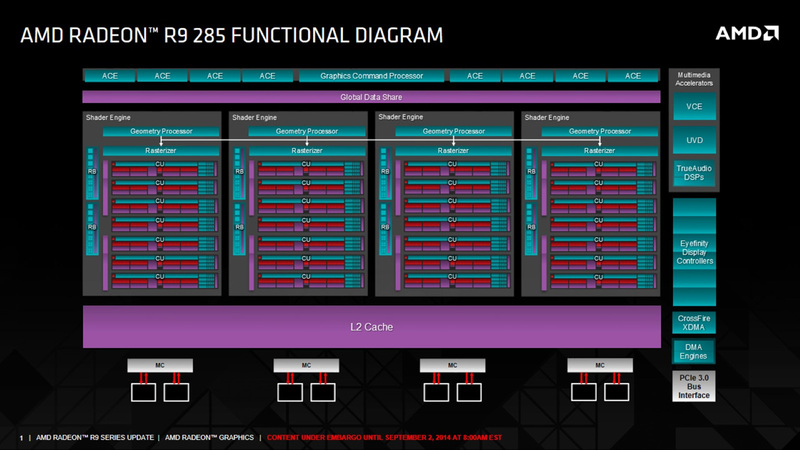 This is paired with the card’s 32 ROPs attached to a 256-bit memory bus, and a 4-wide (4 geometry processor) frontend. Compared to Tahiti the most visible change is the memory bus size, which has gone from 384-bit to 256-bit. In our look at GCN 1.2 we’ll see why AMD is able to get away with this – the short answer is compression – but it’s notable since at an architectural level Tahiti had to use a memory crossbar between the ROPs and memory bus due to their mismatched size (each block of 4 ROPs wants to be paired with a 32bit memory channel). The crossbar on Tahiti exposes the cards to more memory bandwidth, but it also introduces some inefficiencies of its own that make the subject a tradeoff. Meanwhile Tonga’s geometry frontend has received an upgrade similar to Hawaii’s, expanding the number of geometry units (and number of polygons per clock) from 2 to 4. And there are actually some additional architectural efficiency improvements in here that should further push performance per clock beyond what Hawaii can do in the real world. The final die size of Tonga is 359mm2 and it packs an unexpectedly high 5 billion transistors. Compared to Tahiti, this is a very slight (7mm2) increase in die size, while the transistor count has gone up by nearly 700M from Tahiti’s 4.31B transistors. 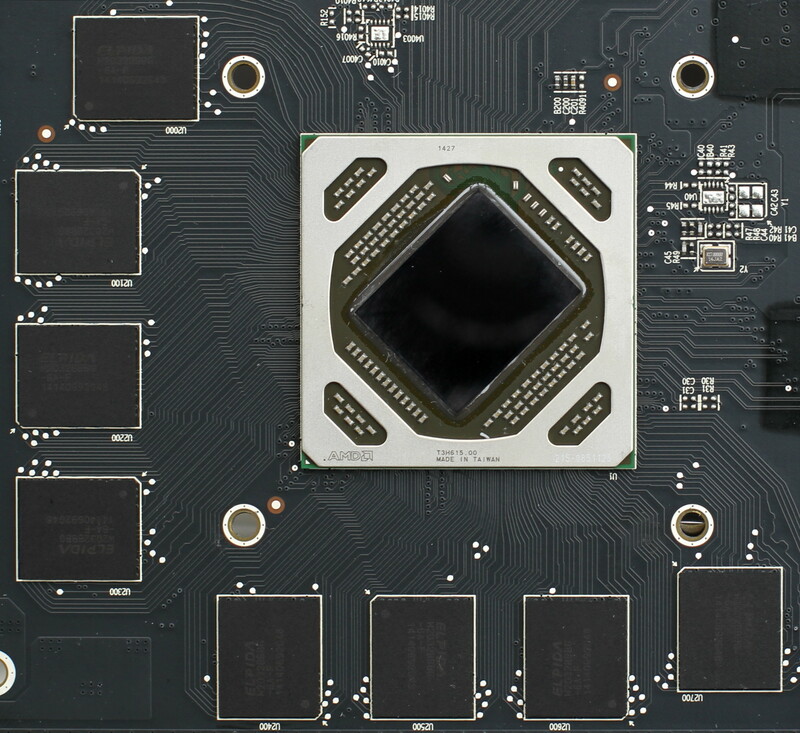 Tonga’s configuration and die size indicate that AMD has made some interesting tradeoffs in terms of die size and features. The narrower memory bus means that AMD was able to drop a pair of memory controllers and the memory crossbar, only for AMD to fill it in with the additional transistors needed to drive all of the additional features (and geometry processors) that Tahiti lacked. Consequently R9 285 isn’t just a lateral in performance, but from a die size and cost standpoint it should be equally lateral, with Tonga being roughly as expensive to produce as Tahiti. However final boards should be slightly cheaper to produce than R9 280 boards – the 256-bit memory bus allows for simpler boards, it only has 2GB of VRAM instead of 3GB, and the reduced power consumption allows for less complex power delivery circuitry. Otherwise when it comes to features, being GCN 1.2 based means that the R9 285 will bring with it support for all of the features first introduced in GCN 1.1. This includes support for True Audio, support for bridgeless CrossFire thanks to the XDMA engine, GCN 1.1’s superior boost mechanism, and full support for AMD’s upcoming FreeSync implementation of DisplayPort Adaptive Sync (GCN 1.0 GPUs are not fully adaptive). AMD will be positioning the R9 285 to compete with NVIDIA’s GeForce GTX 760, the company’s second-tier GK104 part. The R9 280 already compares favorably to the GTX 760, so AMD needs only to not regress to maintain their competitiveness. Meanwhile the GTX 760 was until recently frequently found at $239 – a hair under the R9 285’s launch price – and has since fallen to around $219 in response to the R9 285. What this means is that the GTX 760 has slowly withdrawn itself from competition, taking up a position as a lower performance but cheaper card. It's still NVIDIA's closest competitor at this time, but NVIDIA has wisely realized that they can find a more comfortable spot below the R9 285 rather than trying to compete head-on with it. The launch of the R9 285 has been a hard launch, and with AMD’s partners producing their own designs this is a pure virtual launch (no reference card) with an MSRP of $249. 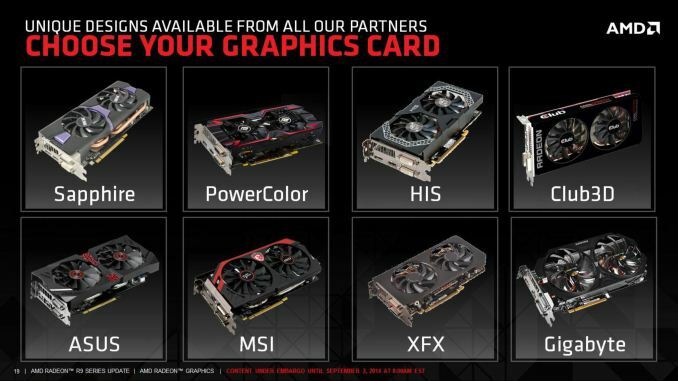 In our briefing AMD also told us that there will be both 2GB and 4GB cards, and from past experience with split launches like these, we’re expecting most cards to be of the 2GB variety. In fact of the first wave of cards that have hit the market, all of them are 2GB cards with 4GB cards yet to reach shelves. Partially due to this lag between 2GB and 4GB parts, AMD hasn’t been able to give us an estimate on what the 4GB price premium is, but it’s going to be an important fact to take into consideration as the suitability of 2GB enthusiast cards has been challenged by the presence of so much RAM on the current-generation consoles, which will have a knock-on effect on console-to-PC ports. Meanwhile with the launch of the R9 285 and impending discontinuation of the R9 280, buyers looking at picking up an R9 285 in the near term will have to be on the lookout for R9 280 on clearance sale. It’s already regularly found for $220 and lower, making it $30+ cheaper than the R9 285 and possessing 3GB of VRAM to the R9 285’s 2GB. This will make the R9 280 a strong contender, at least until supplies run out. Finally, coinciding with the launch of the R9 285 will be a refresh of AMD’s Never Settle bundles. At the gold tier, which will encompass the entire R9 series, AMD is adding Alien: Isolation, and atypically a feature-limited (non-full) copy of Star Citizen to the lineup.